Normally I release the best plays I've developed for every formation on my website, and start each new formation with the best of the best. When I first released the Wyvern formation though, I felt I had enough other good plays that I could save this one, my favorite, for exclusive inclusion in my second book. More recently I've decided that this play is simply too good not to share, and so far it looks every bit as good in Madden 2005 as it did in 2004. Straight up man coverage on the wideouts simply cannot keep up with the key out route run by the #1 WR, hidden in the left side bunch, and the natural overload and tight deployment of Wyvern will cause its share of headaches for more spread out zone coverages as well. 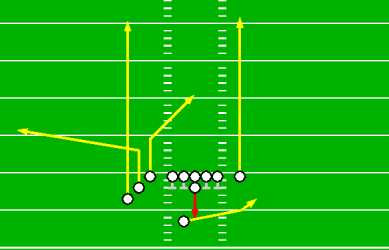 As stated above, the money route is the out pattern. The top WR takes advantage of his position sandwiched between the #3 and #4 guys to guarantee single coverage. The delay by the rear outside receiver pulls his man down while the post draws coverage in, spreading the defense on that side. The only drawback is time, it is possible for this route to get hung up for a brief moment due to the crowding of WRs and defensive backs and the running back does not stay back to pick up blitzers. That's not all bad though, as this play is filled with blitz killer routes. The inside post breaks quickly right over the middle through the area a blitzing linebacker might normally occupy. The swing is run to the weak side and has a chance to run past edge rushers to daylight. While great against man coverage Poseidon is more ordinary against zones, blitzes and press coverage. With practice though, it can still be quite effective. Attacking zones requires taking advantage of the bunch formation which overloads the left side of the field. Throwing quickly at WR breaks will allow completions before overmatched DBs can react. Quick reactions are essential for attacking blitzes. Press coverage can cause issues, especially with the tight receiver deployment, but if the Wyvern formation is setup thoughtfully many effective motions are possible which can spread the play out in the face of rough treatment, creating wider passing lanes. Though the out route is the real achiever, with no extra blockers we look to the hot routes first. The quick post breaks right over the middle, its speed and short distance to the QB means that the defense will not have much chance to react to it. The RB swing is next, due as much to the wide open space on the right side making this a relatively easy read and safe throw as much as its utility as a blitz neutralizer. While glancing over to the right read the LB/slot CB coverage. If the defense is playing zone, and particularly if the defense went with a base or nickel package instead of dime the streak may be able to run free in middle depths behind the LBs and in front of the safeties. Otherwise you can come back to this route later for a deep strike. Now the QB finally looks to the left side. The key here is to read man or zone coverage by this time, because while the out is killer versus man this route runs right towards a CB who sits in zone. Ideally in the case of zone you've already thrown a quick pass to the post or streak, or dumped off to the swing for a safe but likely minimal gain, but don't panic even if the QB is still holding the ball. This play has one trick left. While a man defender will move up to get in the face of the delaying WR4, most zones will leave room while sitting back for the receiver to come to them. Dump the ball just as he starts forward and look for the other left side receivers to lay blocks on the spread zone DBs downfield.